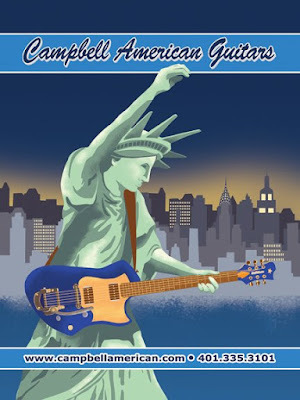 Through sheer proactive phone-calling I landed a freelance job with Campbell American Guitars a few weeks ago. The piece is done and has been sent out to three guitaring magazines and will appear first in Premier Guitar this November. The owner/my art director wanted the piece to have a style like a forties poster, and I'll admit this was a departure for me, but the concept was such a blast that it kept me focused. I'm sure I forgot a strut or a whammy bar or something, but I'm quite happy with the finished product, especially considering how far it's come from earlier drafts. New-media bonus: people who are friends with me on Facebook will see that my profile picture is a Very Special Reference Photo.